Word-a-Day… More Harm than Good? Architects construct buildings using only TENSILE materials in areas that are prone to earthquakes. I look at Excite.com everyday for news, stock quotes, TV schedules, etc., and I always glance at the word of the day. Usually, it’s a word I’m familiar with and the definition of say, “Affable,” is about what I expect, but occasionally, there’s an obscure word or a technical term that I don’t recognize, and I take “the word” at it’s word. Just finished the book Going Nucular by this guy, Geoffrey Nunberg. He’s like this senior researcher at the Center for the Study of Language and Information at Stanford University, and the chair of the Usage Panel of the American Heritage Dictionary. (How jealous am I!?). Anyway, he asks a couple of cool questions, like, if “the pool is deceptively shallow,” does that mean it’s shallower or deeper than it looks? If “she runs best with a minimal amount of food in her stomach,” does that mean she runs best if she doesn’t eat at all, or if she eats just a bit? I have some pretty strong feelings about all this, and I’d be curious to hear comments from some of my favorite writers (and I think you know who you are). 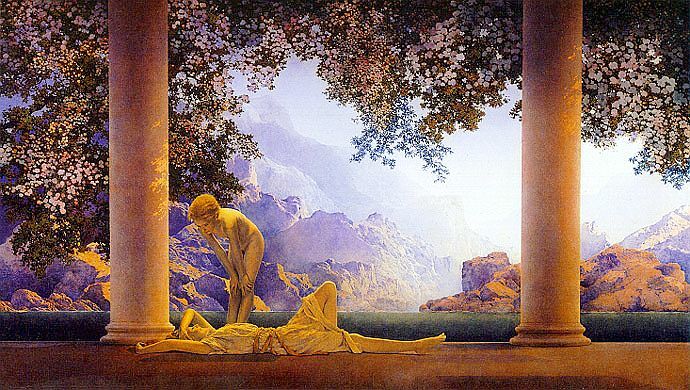 Last Sunday, we took a day off from work and yardwork to go up to Reno (exactly 100 miles from our front door) to see Maxfield Parrish Master of Make-Believe at the Nevada Museum of Art. Very cool. If you live within a couple hundred miles of Reno, next weekend is the last, and we highly recommend it. Please do what you can to help pass the Sanders’ Freedom to Read Amendment. One of the most disappointing results of the terrorist threat is the knee-jerk reaction to impose limits on the freedoms of innocent Americans. The Patriot Act provides for illegal infringements on First Amendment rights that are not supportable in terms of any balanced risk assessment. Perhaps you share my opinion on this issue, in which case, I salute you, but if not, I hope you’ll consider this carefully when you vote on Tuesday. Home, Home Again… it’s good to be here when I can. So The Lady Janet and I spent the last week in NYC. We went to BEA, the annual booksellers’ convention known as Book Expo America, and met with people from Random House, Harper Collins, Simon & Schuster, Time Warner, etc., and snagged a whole bunch of free books &#151 my current read is God Without Religion by Sankara Saranam (whatever, but not yet published). 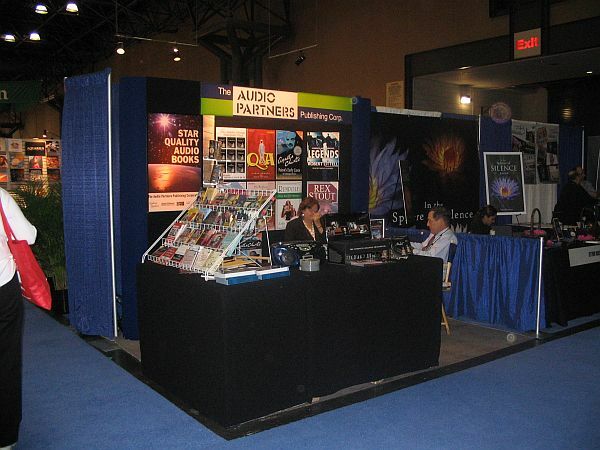 Here’s our booth. 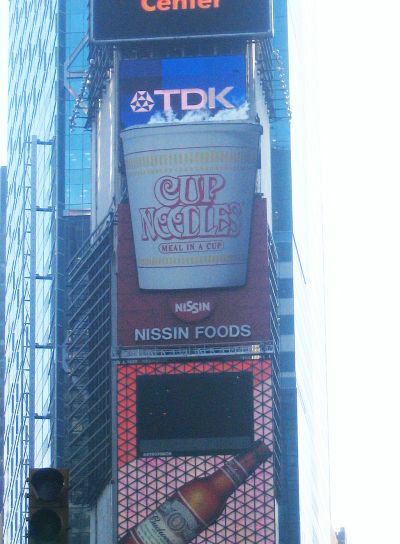 We stayed in a place just off Times Square, which has an amazing 20-foot Cup O’ Noodles that actually steams. Pretty cool. The place we stayed at was a new hotel called the “QT” that was very interesting. The front desk was like a snack counter in a movie theater, with packs of gum and cigarettes under a glass countertop, and there was a small swimming pool in the center of the foyer that you could look into from the bar. 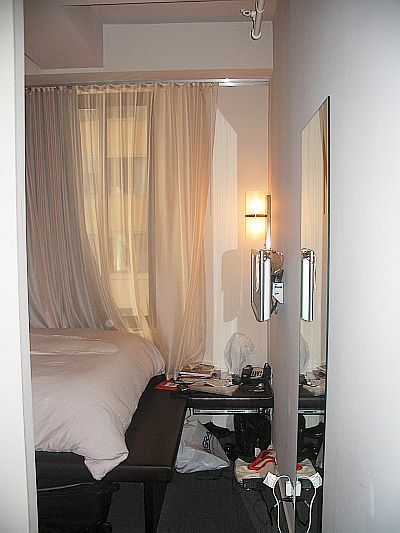 I just kept thinking that it was “tragically hip,” and our tiny, tiny room looked like this and like this. Yep, that’s about it. 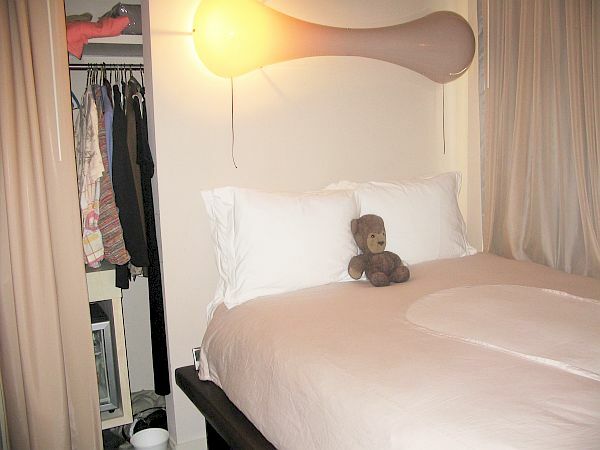 Not a chair, not a table, not a drawer, not a hook, just a nice bed with a bench around it and a fridge in the closet. 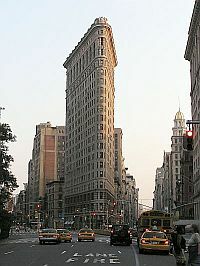 I had a meeting with one of the publishers in the Flatiron Building. It’s a NYC landmark, but unfortunately, they’re renovating, and the whole exterior was covered in shrouded scaffolding, so you couldn’t even recognize it. But our meeting was in a conference room right in the “point” around a triangular conference table, so that was kinda neat. We boarded the plane at 1:40 for a 1:55 flight. The air conditioning had failed, so it was about 85 degrees on board. They had an “air truck” come out and pump cool air through the vents, so after 15 minutes or so, it really wasn’t too bad. A few minutes later, we taxied out towards the runway, and the captain came on and said, “We’ll be taking off shortly, but because of some weather delays, we’re currently 22nd in line for take-off. Turns out that there is a mechanical problem, and the Captain comes on and tells us that there is an error light that they haven’t been able to clear, and the error is “non-deferrable.” So we sit at the gate for awhile and the Captain tells us that maintenance is going to try cleaning the pressure sensors, but that doesn’t work, so they need to get a replacement part, which takes awhile, and they can’t install it right away because now there’s lightning on the runway, and when they do install it, that doesn’t fix it, so they need to get another part, then another. I’ve made that sound like it took about a half an hour, but it was about 3 or 4 hours, and they eventually let people get off the plane to get food or whatever, but they limited it to five people at a time because of some security issue with too many people on the concourse. Around an hour later, they informed us that we’d all need to get off the aircraft because the flight crew was running over their allowable service time and had to take a break, so we all got off the plane for an hour or so. Then they had to test the replacement parts, and after that, they let us back onto the plane. But then they didn’t have enough fuel for the most recent re-route, so we had to wait for refueling. It went on like this like a bad Twilight Zone episode, where they just kept saying things like, “Well folks, we sure do apologize for the inconvenience, but we think we’ll be taking off in just a few minutes,” but it went on for hours and hours. We eventually made it to Denver about 14 hours after we boarded at La Guardia, and we spent the night at a Days Inn, and got home Tuesday evening. We’ve just gotten back from dinner at the Trattoria Trecolori, and I am blogging to you live from the 5th floor of the Hotel QT, right around the corner from Times Square. 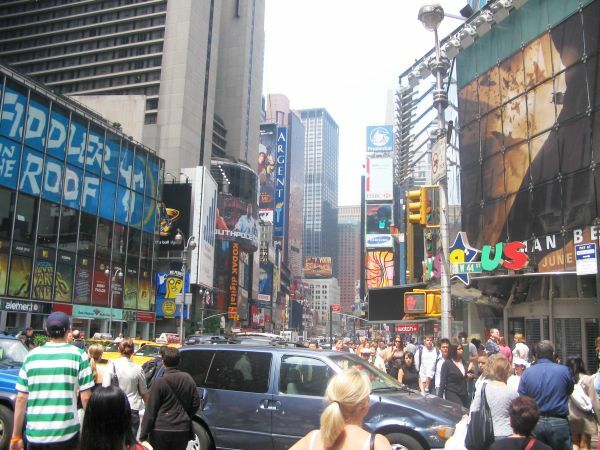 We’re here for the annual Book Expo America convention at the Javits Center this weekend and some other business around The Big Apple. Today was travel day, Sacramento to Denver to La Guardia. We had a spectacular view of the city coming in over Manhattan – skyline, central park, the whole ball of wax. Pretty impressive. The Lady Janet was listening to the captain’s radio on the headphones, and the controller told him, “Past the Verrazano Bridge, past the Statue of Liberty, up the Hudson River,” and the pilot replied, “Got it. Bridge, Lady, River.” If you have small children and watch Dora the Explorer, this might sound strangely familiar, in a slightly disturbing way. I will post more with pictures tomorrow.